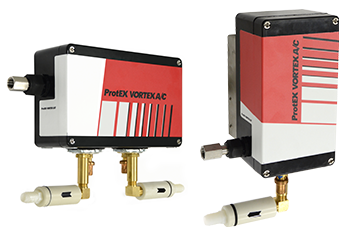 Cooling using Vortex technology is reliable and inexpensive! 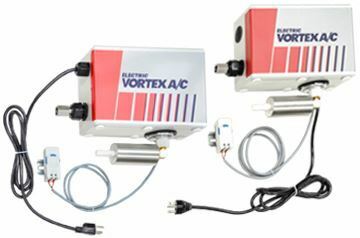 If you are cooling an enclosure please scroll down to our many options in enclosure cooling: our standard vortex cooling (available in Nema 12, 4, 4x), our vortex A/C cooling with mechanical thermostat and quiet operation (Nema 12, 4/4x, Haz Loc, ProtEX, and ATEX)! 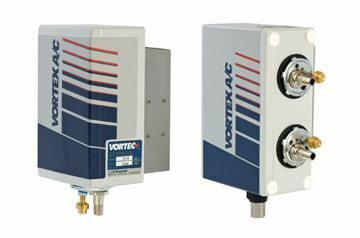 Vortex tubes are a compact source of refrigeration and cooling, with models ranging from 6 – 13 inches (150 – 330 mm) long and cooling capacities ranging from 100 – 6000 BTU/hour (29 – 1757 watts). 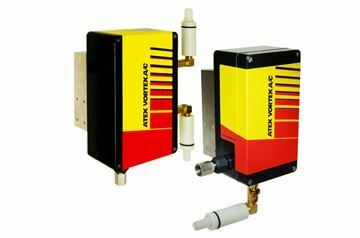 Vortex tube performance is easily adjustable by changing the inlet air pressure, ratio of cool air to exhaust or by changing the generator in the tube itself. And while normally used for cooling, vortex tubes can also be used for heating applications, merely by channeling the exhaust hot air to the application. Vortex tube technology was invented by French physicist Georges Ranque in 1930, and first developed for industrial use by Vortec in the 1960s. Since then, vortex tubes have been applied for a wide range of cooling applications on machines, assembly lines, in processes and for testing and measurements. Air that rotates around an axis (like a tornado) is called a vortex. A vortex tube creates cold air and hot air by forcing compressed air through a generation chamber, which spins the air at a high rate of speed (1,000,000 rpm) into a vortex. The high speed air heats up as it spins along the inner walls of the tube toward the control valve. A percentage of the hot, high speed air is permitted to exit at the valve. The remainder of the (now slower) air stream is forced to counterflow up through the center of the high speed air stream in a second vortex. The slower moving air gives up energy in the form of heat and becomes cooled as it spins up the tube. The inside counterflow vortex exits the opposite end as extremely cold air. Vortex tubes generate temperatures as much as 100 deg F (56 deg C) below the inlet air temperature. The fraction of hot air exhausted can be varied to change the outlet cold air temperature, with more exhaust resulting in a colder cold air stream (with lower flow rate), and less exhaust resulting in a warmer cold air stream (and higher flow rate).